I'm so happy to have another cottage to share with you. Several weeks ago I received a nice email from Marie of Sugar and Loaf. 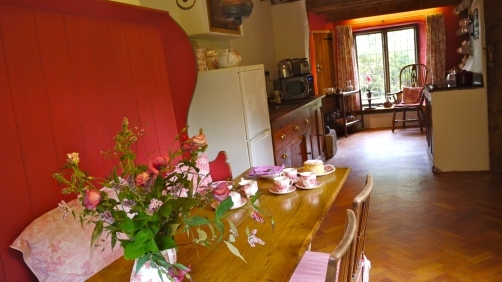 Her company manages holiday homes in the Welsh mountains. 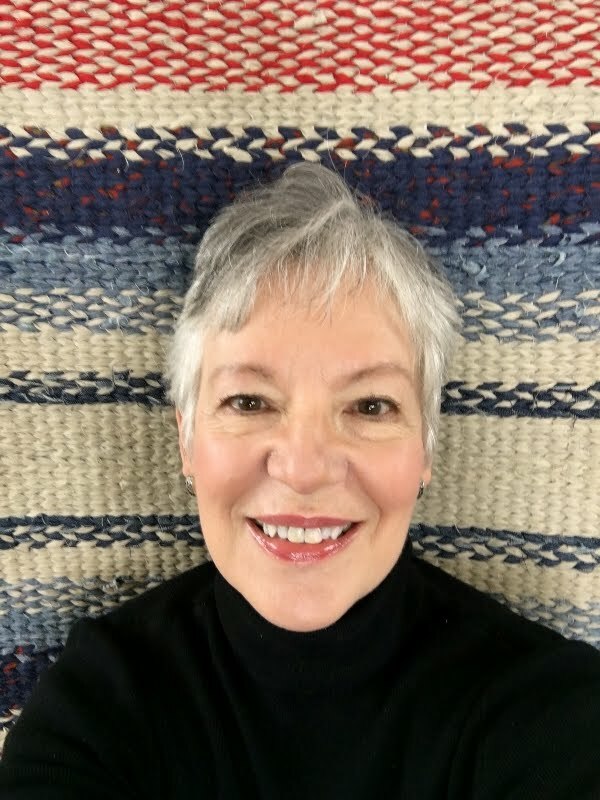 Marie complimented me on my blog and invited me to peruse her website. Well, of course you know I did, and when I came across The Old Smithy I fell in love. I wrote Marie and asked if I could share it with you and she graciously said "yes". 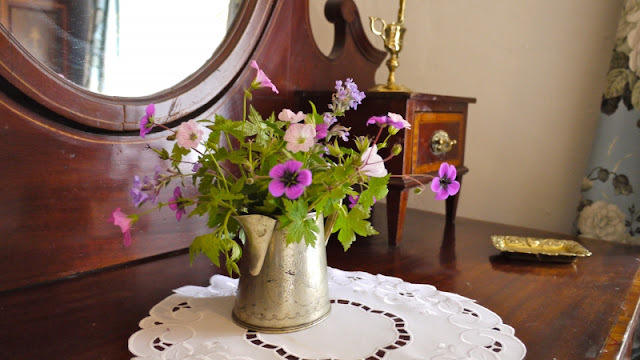 This is what I love most about A Joyful Cottage blog --the chance to meet nice people from around the world, and to occasionally have the grand opportunity of showing off a cottage. 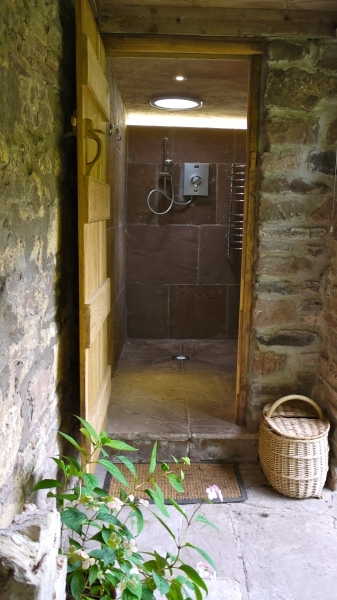 So without further delay, let's tour The Old Smithy in Brecon Beacons National Park. In my opinion, this is the perfect entrance to a cottage. Lush with climbing vines and flowers. Just to see it brings a smile to my face. 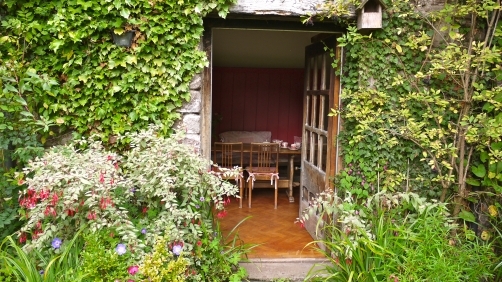 The traditional painted Welsh settle faces the entry and sets the stage for this quaint cottage. 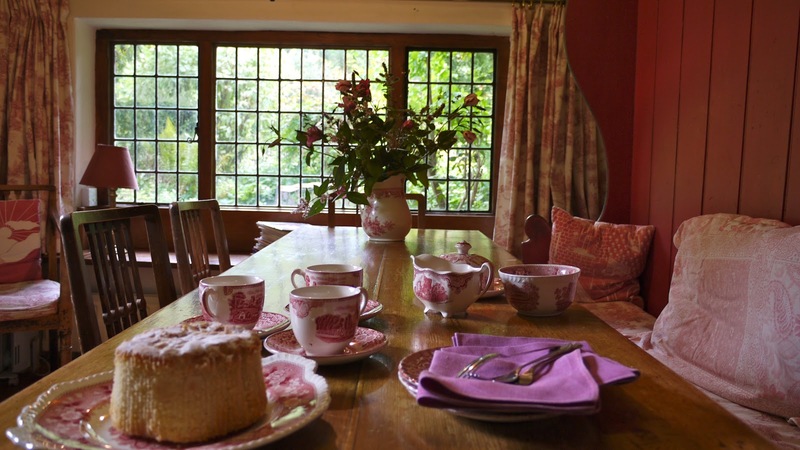 I can imagine sitting around the farm table with friends, enjoying afternoon tea. I'm charmed by this room's red and white theme, and the transfer ware is a perfect addition. So cottagey. 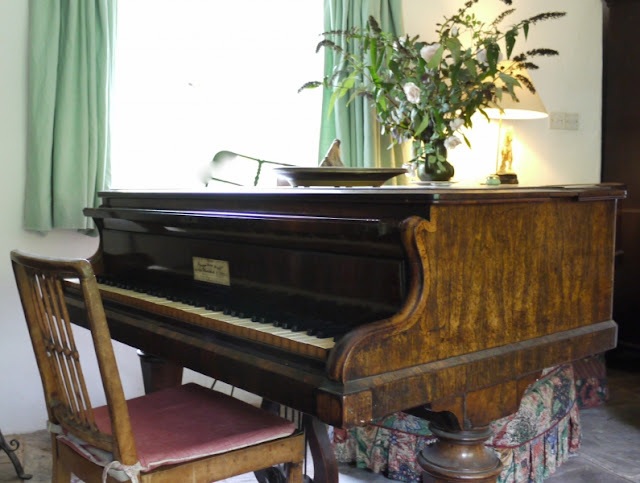 A grand piano brings the promise of a melody to the cottage. I find myself wondering how many tunes have been played on those keys. 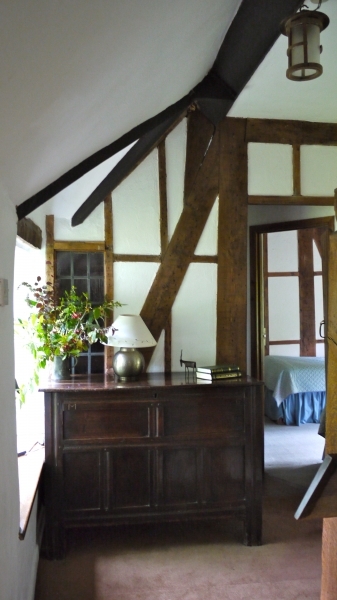 I seriously cannot get enough of the oak beams and trim in this cottage. Love, love, love it. And the deep window wells. Do I have to tell you how much I like those? 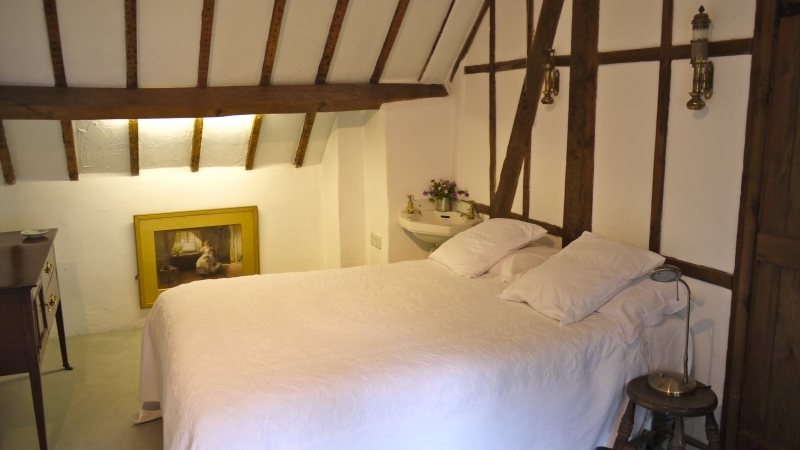 Is that painting on the little short wall just the sweetest idea ever? If one day I move to a cottage with an architectural detail like that, I am for sure going to remember to do this. I mean, really. I love it. I'll admit I'm an old-fashioned girl. I love white cutwork doilies on antique dressers like this. It takes me back to my grandmother's bedroom in the old farm house where I grew up. She lived with us until I was nine years old. Every morning I watched in wonder as she brushed out her long hair (she could actually sit on it!) and then braided, wrapped and pinned it into a bun at the back of her head. Alright, enough reminiscing. Back to The Od Smithy. 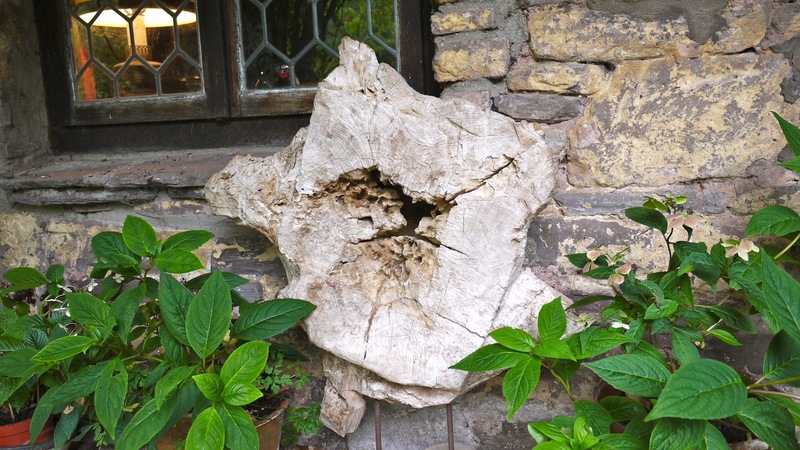 . .
An old gnarly tree trunk greets guests on the way to the outdoor shower room. No ordinary shower. This is a "blasting power shower". Hmmm. Sounds like fun. 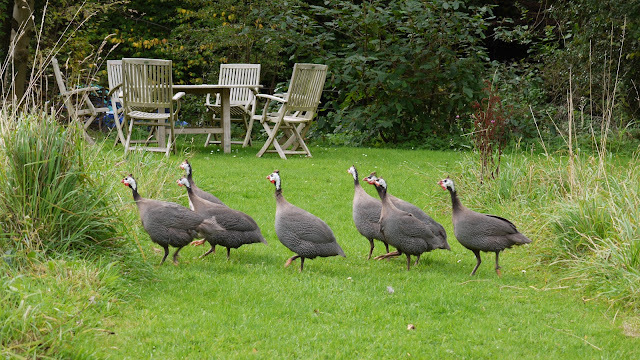 Guinea fowl in the backyard remind us that this is, after all, the Welsh countryside. Oh, I hate to say "good-bye" so soon to this lovely place. 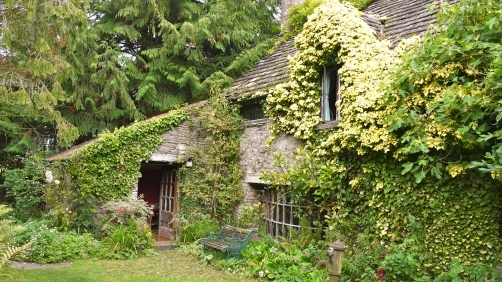 A most hearty "thank you" to Marie and Sugar and Loaf for allowing me the privilege of sharing this wonderful cottage. 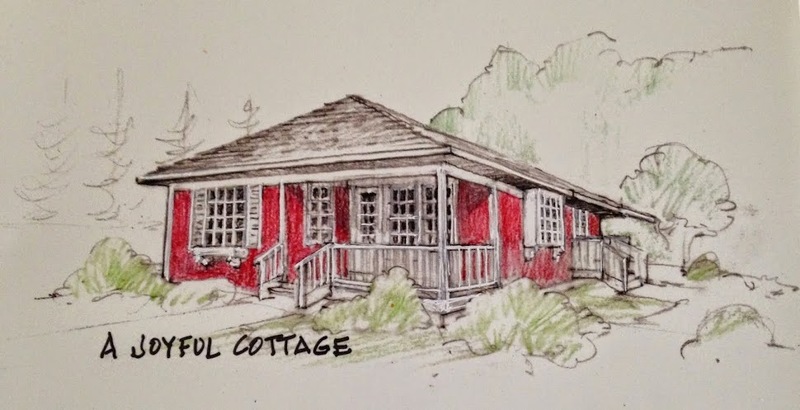 For more cottage gawking ;), visit Sugarandloaf.com. They have a blog, too. Until next time, dear ones, fare thee well.